The spacious, open plan design – open both to the interior, and to the exterior with floor to ceiling windows - creates a convivial living space that would be ideal for a family reunion or getaway. Anchored around a large well-equipped kitchen with a central island, are an indoor lounge with home theatre system, a dining area and a shaded outdoor terrace and pool deck – you can also jump into the water straight from the living room. 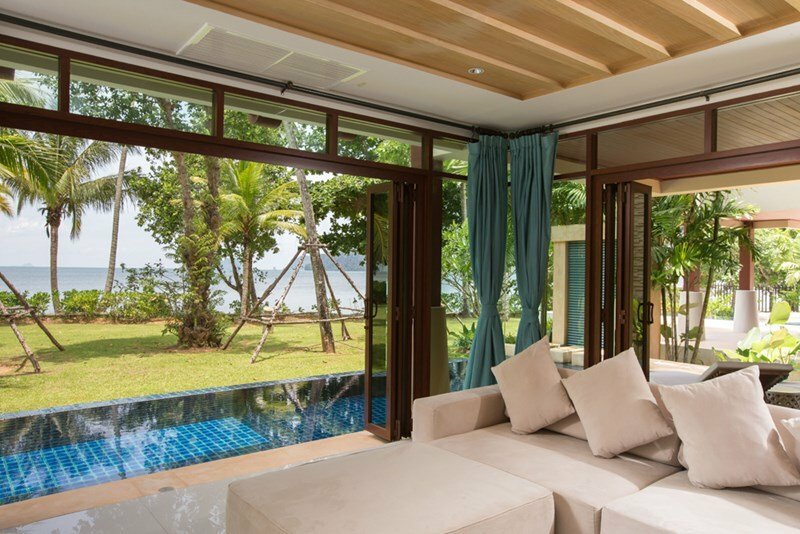 The villa’s five bedrooms will accommodate up to 10 guests comfortably. The first bedroom, on the ground floor, has a queen size bed, TV with DVD player, plenty of built-in storage and access to the communal bathroom directly opposite. Four more bedrooms are located upstairs. The sea-facing master suite, with its king size four-poster bed, is especially generous in size and features a spa-style bathroom with double vanity, indoor and outdoor shower rooms, a central bathtub and walk-in closet. There is also a small lounge area and a sunroom set up with massage beds (in-house treatments are available). This can be fully opened to benefit from the ocean breezes and panoramic island views. The garden stretches the full length of the wide 200m beachfront. There is a splash pool directly in front of the villa, while a larger communal pool is also available within the development for those who wish to swim laps. The villa may be rented with Amatapura Villa no. 1 for large groups who wish to stay together. The two villas are located within the same development and are around 150m apart.